The EURUSD chart has been in a steady bearish decline since the late part of September into November. Read on to get an overview of the technical analysis and fundamental triggers responsible for the current price oscillations. We’ll use the above chart to carry out a combination of most recent technical and fundamental events. As a binary options trader, I often prefer the 2hourly chart for taking a short-term call or put positions. Making reference to the chart above, a breakdown of bullish accumulation pattern led to price closing below the MA-65, and flow into a bearish trend. Prior to the market entering the U.S session on Wednesday 28, the technical chart had triggered a bullish regular divergence pattern on the 27th of November. This quarters GDP released on the 28th came out unfavourable for the U.S economy and consequently had a negative impact on the U.S dollar. The actual data was 3.5 compared to a forecast of 3.6, leading to a bullish price thrust at the point of release; also confirming a double bullish regular divergence pattern shown above. Also known as a second GDP release, this highlights the value of goods and services produced by an economy. The GDP data released are of 3 types separated by a 1month interval. These include Advanced, preliminary and Final GDP. The prelim GDP, which is released quarterly, about 2months following an end to a quarter. Later today, traders will be paying close attention to the results of Unemployment claims which is a stat of the number of unemployment insurance filed by citizens in the U.S. Though low impact news, an actual result less than the forecast is positive for the USD. After a bullish accumulation pattern formed during the Asian session today November 29, price continued to attain more strength for the EURO. At the London open, and opening of Europe markets, the price chart broke below a bullish accumulation support, offering shorting opportunities for a binary options trade. This coincided with the Spanish Flash CPI which came out negative. ECB president Mario Draghi’s cancelled speech cuts traders expectation of high volatility short as such events often lends clues to interest rate direction of the ECB. 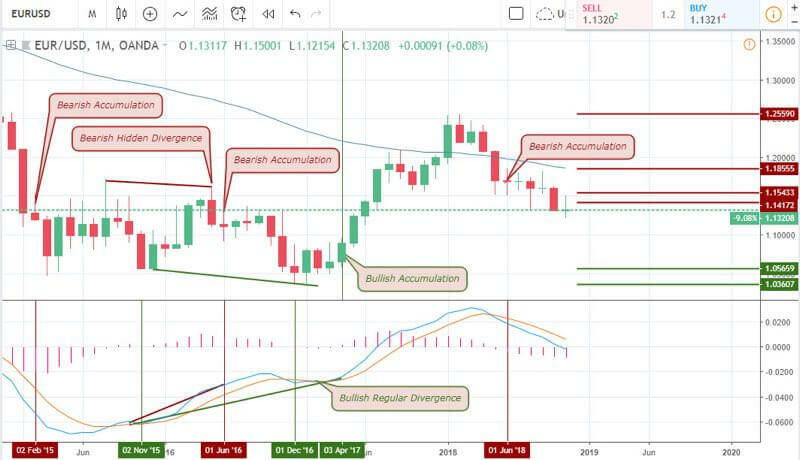 The EURUSD foreign exchange pair is one of the major currencies in our portfolio we consider a good candidate for a multiple time frame analysis, using our consecutive bullish/bearish framework. This framework equates the consecutive bars of an assets’ considered higher time frame to immediate rising troughs of an immediate lower time frame to a third time frame oscillatory cycle, which can be identified by the MACD oscillator (9,21,5). A typical example is the Monthly, weekly and daily time frames in successions. Let’s continue with by doing a top-down analysis of the EURUSD pair, starting with the monthly. From the above monthly chart, we’ll notice that price entered into a channel made up of a bearish and bullish divergence pattern on June 2016, and December 2016. 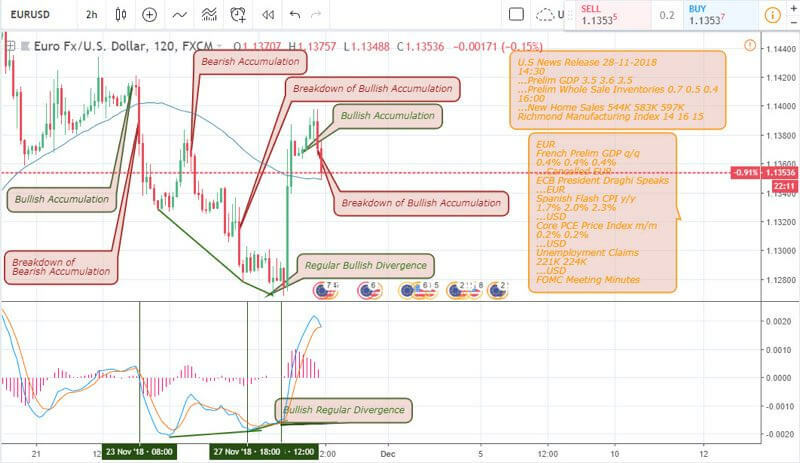 Both divergence patterns were followed either a bearish accumulation pattern in the case of the bearish hidden divergence and a bullish accumulation in combination with bullish regular divergence. The bullish regular divergence pattern brought an end to the bearish oscillation and jolts price into a series of consecutive bullish closing bars. Price closed above the 65-period moving average and later closed below it while forming a bearish accumulation pattern thereby signalling an overbought Euro. The weekly chart clearly highlights a breakdown of bullish accumulation on February 5 2018, offering an early warning signal for an overbought EURUSD pair. Bearish accumulation patterns formed on March 12, April 3, and May 7, quickly illustrates the change in traders’ sentiment from bullish to bearish. Upon a first bearish close below the 65-period moving average from a weekly chart perspective, the price quickly entered into a cyclic pattern, indicating a shift in a sequential bar direction of the monthly chart. This also indicated possibilities of bullish divergence patterns which can be confirmed from a golden cross of the oscillator or a breakout of bearish accumulation resistance of 1.14991, which we consider a leading indicator. After trading above the 65-period moving average around September 17, the EURUSD price slumped as a result of a bearish accumulation pattern formed on September 24. This pushed the price below the moving average indicator and lead to an oscillatory flow of the MACD (9, 21, and 5). As the price trades below the MA-65, the MACD oscillator triggers a bullish and later a bearish hidden divergence pattern. The current bearish divergence pattern coincides with a breakdown of bullish accumulation on November 23, establishing a strong resistance level at 1.14334. 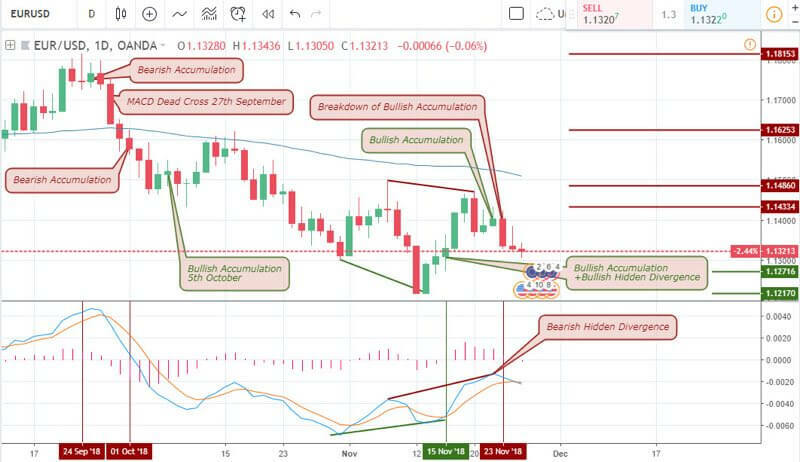 For rapid binary options trading, we’ll recommend the lower 5mins chart similar to the one shown below as it highlights a MACD golden cross in combination with a bullish accumulation pattern on November 29, later followed by a bearish regular divergence pattern and an opposite dead cross. The daily chart is our recommended timeframe for a mid term trend direction, establishing a resistance level at 1.14860 for a short sell trade.